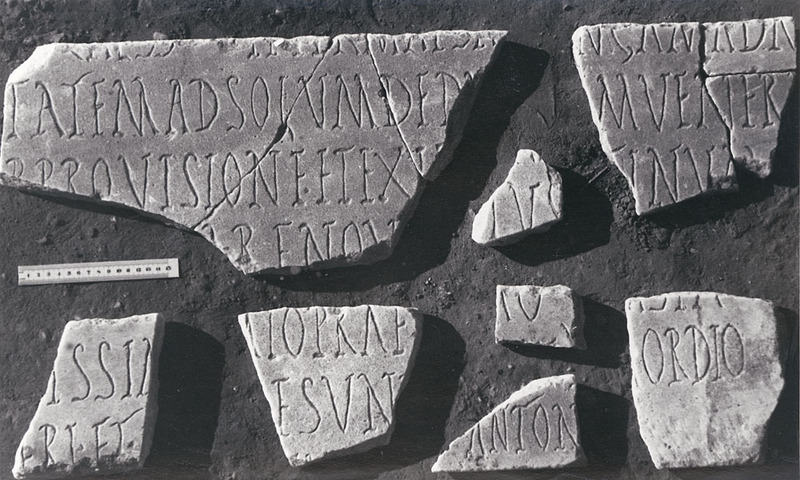 Six fragments of a marble panel. a) w: 0.27 x h: 0.21 x d: 0.025, no edges surviving; b) w: 0.55 x h: 0.24 x d: 0.025, no edges surviving; c) w: 0.17 x h: 0.16 x d: 0.025, no edges surviving; d) w: 0.10 x h: 0.08 x d: 0.025, no edges surviving; e) w: 0.15 x h: 0.17 x d: 0.025, last two lines; f) w: 0.15 x h: 0.09 x d: 0.025, last line. Late form of Rustic capitals: 0.05-0.055; last line 0.04.
f. ?with Antonius [·· ? ·· ?looking after the work].